12:00 p.m. – Despite scattered rain across much of the state, the fire danger in parts of the Interior and southwest Alaska remains high due to windy, drier weather and the threat of lightning. With the 15,200-acre Whitefish Lake 1 Fire about six miles south of Kalskag now 80 percent contained, firefighters in southwest Alaska are shifting their focus to the larger Bogus Creek Fire, which is burning about eight miles to the south. 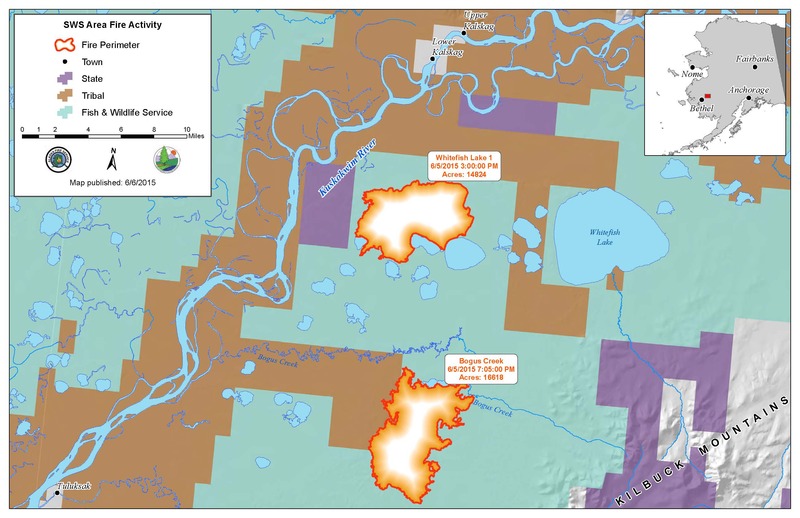 Both fires were started by lightning on May 31st and are burning primarily in the Yukon Delta National Wildlife Refuge. Firefighters have been battling the Whitefish Lake 1 Fire for the past week and have secured the perimeter of the fire. The Bogus Creek Fire has been burning unchecked since it started because it did not pose a threat but fire managers now want to check its spread. The current plan is to move four initial attack crews from the Whitefish Lake 1 Fire to the Bogus Creek Fire today to work on the northeast side of that fire, which at last report was estimated at approximately 20,000 acres. One of those crews, the Pioneer Peak Interagency Hotshot Crew, was mobilized from the Whitefish Lake 1 Fire on Friday to work on a 5-acre spot fire that crossed the west side of Bogus Creek. Fire managers hope to take advantage of a favorable weather forecast to stop the fire before it burns east into the Kilbuck Mountains. The plan today is to have crews work on fingers of the fire that are moving to the east. Aerial support in the form of four water-scooping aircraft will also be used to stop the fire from reaching the Kilbuck Mountains or from burning any further west of Bogus Creek. The Bogus Creek Fire is described as a very large, wind-driven grass fire burning in open tundra. It is not threatening any Native allotments or structures at this time. The two remaining crews that have been working on the Whitefish Lake 1 Fire expect to be demobilized by Sunday. The fire will be monitored by air. Four new fires were reported on Friday. The largest was the Red Gate Fire that burned 2.2 acres behind the Tanana Valley Fairgrounds in Fairbanks. Forestry engines, prevention and helitack responded along with the University of Alaska Fire Department. The fire was knocked down by bucket work from the helicopter and personnel on the ground. The fire has been contained and controlled and placed in monitor status. Prevention determined that children playing with a lighter were responsible for the fire. Prevention talked with the children and their parents. An escaped slash burn pile that was left unattended 12 miles south of Copper Center is the cause of the Post Road Fire. Forestry responded and suppressed the fire. Two other reported fires were the result of trees on power lines burning a .1 acre each. Tok area forestry responded and extinguished both the Northway Power Line and MacKenzie Trail fires. A squad of seven emergency firefighters joined the eight smokejumpers Friday on the Innoko River Fire as it grew to 80 acres. Personnel did a 20-acre burn-out operation to protect an allotment. The weather on the fire was sunny and windy, which caused the fire activity to pick up and added to the increase in acreage. Fire personnel made good progress with mop-up operations and worked on multiple interior smokes that were discovered on the Getmuna Creek Fire. The fire was called 100% contained at 62.5 acres Friday evening and plans are being made to begin demobilizing the earliest arriving crews. The White Mountain Type 2 Initial Attack Crew was released from the 37-acre Cummings Road Fire east of Delta Junction. The TCC T2IA crew remains on the fire making good progress on expanding the perimeter line. A dozen deep ash pits consumed much time and water. The fire is nearly 100% contained. More rain fell on parts of the Seventy Mile Fire near Eagle on Friday. The Midnight Sun Interagency Hotshot Crew continued with line construction on the 2,800-acre fire. Fire personnel walked the perimeter of the Seaton Roadhouse Fire on Friday. No visible smokes were reported on the 338-acre fire 10 miles from the Canadian border along the Alaska Highway. The fire that started May 20th remains in monitor status.